Even on a 90 degree August evening, it reminded me of Christmas. You know, I had just settled down for a long summer night, then boom, boom. Tommy Hanson's very first pitch of the game flies long into the hot summer night. The next batter also goes yard off Hanson. So much for my long summer night with the Braves. 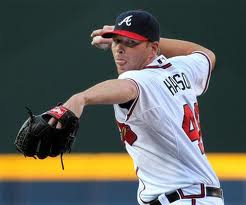 He goes on to give up a season high four homers for the Braves in a 7-1 loss to the division surging Florida Marlins. Hanson had gone 49+ innings without giving up a home run. His last four-sacker was on July 16th. On the other hand, he hasn't won a game since July 3rd. He's allowed twelve runs in his last ten innings. It's not the time in the season for one of Atlanta's best throwers to be slumping. It's a pennant race guys. Everyone has to bring their 'A' game now. Was Friday night a must-win game? They all are now. Like I said, it's a pennant race.